Helloooo carrot cake lovers, Happy Sunday to y’all! I’ve been away for the last few days enjoying and binging on my mum’s cooking including this moist-like-you-can’t-believe-it, and healthy-so-you-can-enjoy-an-extra-slice simple eggless wholewheat carrot cake. 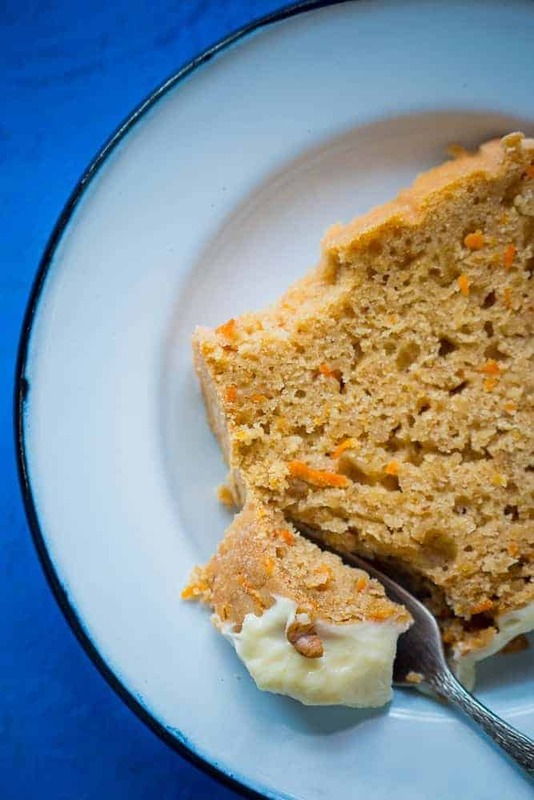 This carrot cake is such a dream recipe to have in your recipe box, and one of those that you most definitely will make again, especially since it’s whole wheat = automatically healthier. And it’s eggless because soooo many of you keep asking me for eggless cake recipes. I’m usually not an eggless cake person, but this time, I’ve gotta admit, I couldn’t tell the difference. My mum and I had a ball this time, trying out new recipes, testing them over and over again so that we could get them just right, eating out till we were about to burst and checking out everything we could in Bangalore in the short time that she was here. It couldn’t be a more perfect ten days! We ended up trying out this carrot cake recipe quite a few times. The first time it was a bit sticky, the second time it was a bit dry, and so on. We finally managed to get the proportions so that it could remain eggless, wholewheat but still be soft, moist and have a beautiful crumb. Since I already had some cream cheese lying around in the fridge, I couldn’t resist making a simple frosting to go with the cake. Because c’mon – carrot cake with cream cheese frosting and chopped walnuts is as good as it gets! This did make it less healthy, but who cares when it tastes soooo good! This has to be your Sunday project so that you can have a delicious slice for the next 3 days. That’s why I’m posting it today. 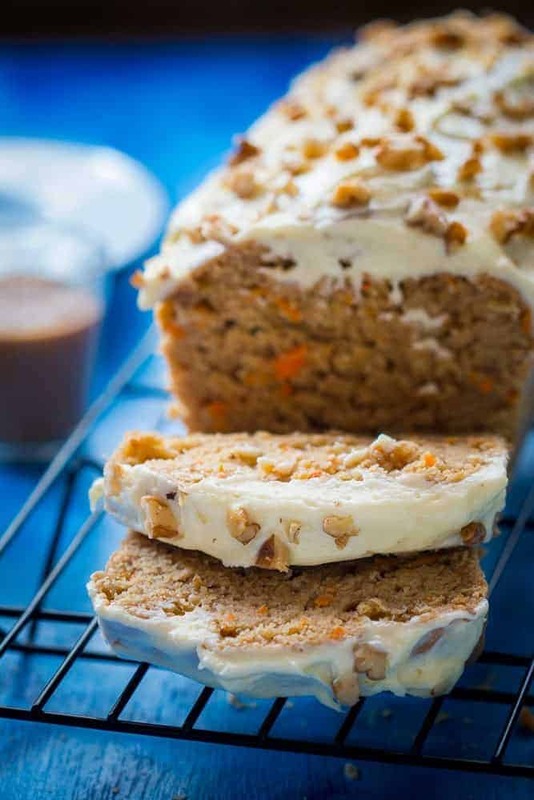 Gather all your ingredients, grease your baking pans and get ready to bake the best carrot cake you will every have! Don’t forget to make yourself a delicious cup of masala chai when you cut yourself a slice because that combination is what tea times are made of! If you try this out, don’t forget to tag your pictures #myfoodstories on Instagram and give me a shout out! 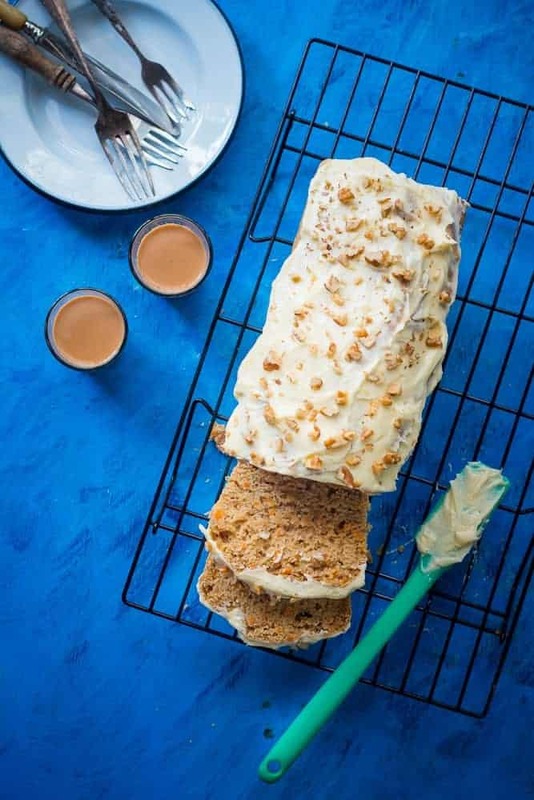 This is a simple recipe for eggless, whole wheat carrot cake which is soft, moist and fluffy! Easy to make at home, and perfect as a dessert or tea time snack! Pre-heat oven to 175 degree celsius. Grease and line an 9 X 4 inch Loaf tin. In a small bowl, add lemon juice to milk and let it stand for 10 minutes till you prepare the other ingredients. Sift together both the flours, baking powder, cinnamon powder, clove powder and salt in a bowl and set aside. In a large bowl, cream together oil, orange or lemon zest (whichever you are using) and brown sugar using a hand mixer or stand mixer. Whisk in milk and vanilla extract. Add the flour mixture, and mix till no lumps exist. Fold in the grated carrots and walnuts into the batter. Pour batter into the loaf tin and bake for 1 hour or till a toothpick inserted into the center comes out clean. Once baked, let the cake cool in the pan for 10 minutes after which insert it out onto a wire rack to let it cool before serving. How did you make he cream cheese icing? Hey Jennifer, I don’t have a recipe yet but I’ll put it up soon. How to prepare the cream cheese frosting??? Ty Richa! Will try and reply you..
Looks soo yummy richa! awesome clicks! Hey Binada, this is primarily an eggless recipe so I’d recommend not changing it up. But if you do want to use eggs, reduce Milk to 1 cup and add 2 Eggs. It should work, but I’ve never tried it. I want to add eggs, so how to go about it?? can you please explain the 4th step a bit more.. what is zest? and vanilla? you mean the essence? Samiksha it will curdle slightly and that’s the point. But that doesn’t mean it’s spoilt. This is the process to make a substitute for buttermilk in baking recipes and is a very common practice. Wanted to check with you .. If I added lemon juice and milk together and leave them for sometime won’t It get spoilt and become like paneer ? In eggless baking, absence of leavening/ rising agent (=eggs) in addition to baking powder is made up for via making soda which needs an acid to react and let out CO2 which will aerate the cake. This can be achieved by the use of curd/buttermilk(acidic) or simply adding a tbsp of lemon juice at the end to the mixture. Baking soda reacts with citric acid and aeration starts. Milk is essentially used for flavour/body of the batter. So if you don’t like the idea of curdling the milk, simply combine all the wet ingredients and dry ingredients, make a lump free batter and add the lemon juice just at the end, combine and immediately pour batter to the mound and bake. It’s all chemistry in the end….hence the emphasis on proportions and sequence and temperature settings. Hope this helps! Mom’s recipe are always best. Can’t believe this one is eggless. Looks so moist.